Solar power was once the domain of futurists and environmentally minded suburbanites. Today it is part of mainstream America. Scan the skyline of downtown neighborhoods, check out the rooftop of the nearest Walmart, and take a close look at your local sports arena. Chances are you’ll find solar panels in those and many other unexpected places. In Harness the Sun, Philip Warburg takes readers on a far-flung journey that explores America’s solar revolution. Beginning with his solar-powered home in New England, he introduces readers to the pioneers who are spearheading our move toward a clean energy economy. We meet the CEOs who are propelling solar power to prominence and the intrepid construction workers who scale our rooftops installing panels. We encounter the engineers who are building giant utility-scale projects in prime solar states like Nevada, Arizona, and California, and the biologists who make sure wildlife is protected at those sites. Warburg shows how solar energy has won surprising support across the political spectrum. Prominent conservatives embrace solar power as an emblem of market freedom, while environmental advocates see it as a way to reduce America’s greenhouse gas emissions. At the same time, economic-justice activists celebrate solar’s potential to lift up low-income communities, and Native American leaders welcome the income and jobs that the industry will bring to their communities. Yet solar energy has its downsides and detractors too. Conservationists worry about the impact of large solar farms on protected animal species, and some local citizens groups resent the encroachment of solar projects on farmland and open spaces. Warburg gives voice to those at the epicenter of these conflicts and points the way to constructive solutions. 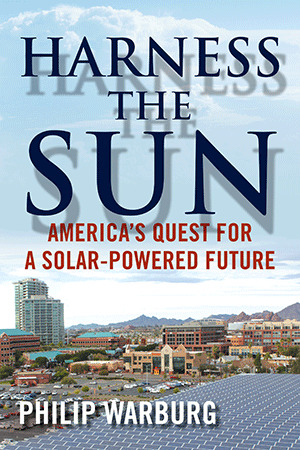 Harness the Sun offers a grounded, persuasive vision of America’s energy future. It is a future fueled by clean, renewable sources of power, with solar at center stage. —Deborah Sawyer, founder and CEO, Environmental Design International, Inc.